Sandy Carter is Vice President, Social Business and Collaboration Solutions Sales and Evangelism at IBM, where she is responsible for setting the direction for IBM’s Social Business initiative, working with companies who are becoming Social Businesses, and being the evangelist for the concept and best practices around Social Business. Yesterday afternoon here in Singapore, we started our Livestreaming endeavours at IBM InterConnect and one of the first folks I interviewed has been a beacon of leadership when it comes to social business, inside and outside IBM, and that is Sandy Carter. Sandy currently serves as vice president for IBM’s Social Business and Collaboration Solutions Sales and Evangelism, where she is responsible for setting the direction for IBM’s Social Business initiatives, working with companies who are becoming social businesses, and being the evangelist for the concept and best practices around social business. Prior to her current position, Sandy was VP, Software Business Partners and Midmarket where she was responsible for IBM’s worldwide software ecosystem initiatives, and prior to that also VP, SOA, BPM and WebSphere Strategy, Channels and Marketing where she drove IBM’s Service Oriented Architecture (SOA) marketing efforts to achieve 70% market share for SOA, and where IBM WebSphere became a market leader, receiving more than 34 industry awards. Fast Company named Sandy one of the most influential women in technology, and Everything Channels CRN magazine named her one of the most powerful 100 women in channels in 2010 and 2009. Sandy is the best selling author of two books: “The New Language of Business: SOA & Web 2.0”, which won the Platinum MarCom Award in 2008, and “The New Language of Marketing 2.0: Social Media”, which won the Silver MarketingSherpa award in 2009. Sandy and I chatted about a variety of social business relevant topics, in which she also offered some advice to both companies and individuals looking to better establish their brands in an increasingly crowded social marketplace. Click to enlarge and view the full infographic. IBM announced earlier today that for the third consecutive year, IDC ranked IBM number one in worldwide market share for enterprise social software. According to IDC’s analysis of 2011 revenue, IBM grew faster than its competitors and nearly two times faster than the overall market. 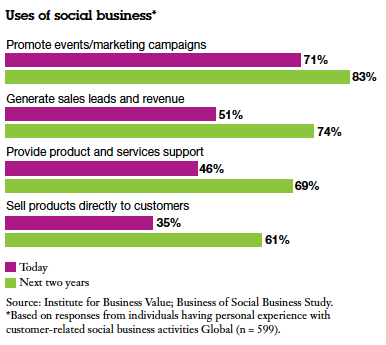 Currently, more than one-third of the Fortune 100 use IBM social business software. It’s official: For the third year in a row, IBM has been found to be the most social enterprise company around. For the third year in a row, IDC has ranked IBM number one in worldwide market share for enterprise social software. According to their analysis of 2011 revenue, IBM grew faster than its competitors and nearly two times faster than the overall market (which grew approximately 40 percent). IDC also forecast the enterprise social platforms market is expected to reach $4.5 billion by 2016, representing growth of 43 percent over the next four years. Much of that growth comes with the continuing popularity of social networking, with more and more organizations looking for ways to adopt social business practices to integrate global teams, drive innovation, increase productivity and better reach customers and partners. While this demand is on the rise, organizations are still looking for ways to embrace social capabilities to transform virtually every part of their business operations, from marketing to research innovation and human resources, but lack the tools to gain insight into the enormous stream of information and use it in a meaningful way. “Social software is gaining in momentum in the enterprise,” says Michael Fauscette, group vice president for IDC’s Software Business Solutions Group. Today, more than 35 percent of Fortune 100 companies have adopted IBM’s social software offerings including eight of the top 10 retailers and banks. 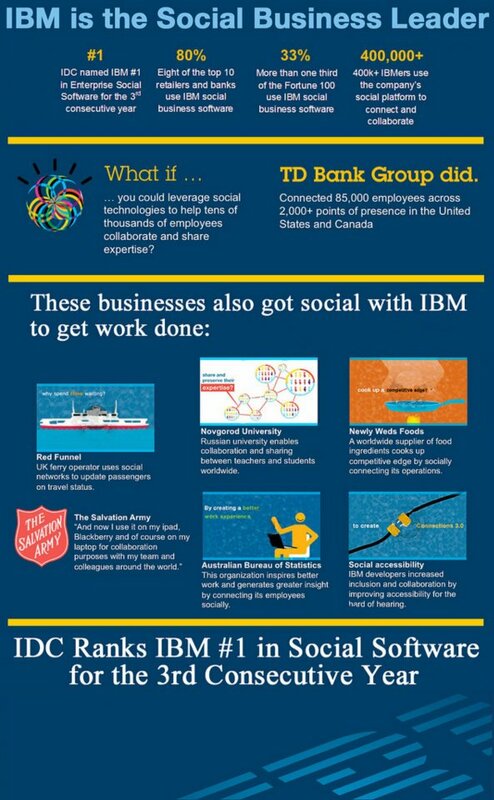 IBM’s social business software and services is unique combining social networking capabilities with analytics to help companies capture information and insights into dialogues from employees and customers and create interactions that translate into real value. IBM’s social networking platform, IBM Connections, allows for instant collaboration with one simple click and the ability to build social communities both inside and outside the organization to increase customer loyalty and speed business results. IBM Connections is available both on premise and in the cloud. 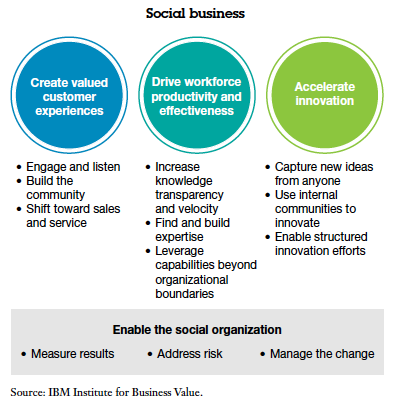 “The opportunities for organizations to adopt social business processes to connect people and speed innovation is limitless,” said Alistair Rennie, general manager, social business, IBM. Learn more about IBM and social business technologies here. Whew. Well, I seem to have scooted out of Orlando JUST in time. As my JetBlue flight was careening down the runway prepared to take off for Austin, I was able to see the massive Boeing 747 that is Air Force One parked just across the tarmac. Apparently, President Obama was in town to talk tourism at the Magic Kingdom. But I didn’t leave before I had the opportunity to interview key IBM Collaboration Solutions market researcher, Carol Galvin, and senior consulting strategist, Catherine Lord, on the business opportunity and market landscape around social business. If you’re trying to get a better understanding of “where’s the beef” around the social business opportunity, this is a great place to start. Let me just share one whopper of a sound byte that should capture your attention: The social business market opportunity is expected to reach $99 billion by 2015! A special thanks to Scott Laningham, my remote videocaster-in-chief, who stopped working on his skateboarding bulldog videos long enough to help produce this video via Skype from Dolphin Studio 8004 (better known as my hotel room). If you’re fortunate to make it to Lotusphere, or any of the other signature IBM events held around the globe every year, you get the opportunity to meet some of the most interesting people: everyone from fellow bloggers to other IBMers to customers to analysts…the list goes on and on. Just last evening, I was introduced to a gentleman by the name of Bill Ives, an analyst and blogger with Merced Group who writes about knowledge management and social business, among other topics. As we got to talking, I discovered that Bill had lived in the town I hail from and grew up in, Denton, Texas, once upon a time when he was a wee lad, and who also shares my passion for golf. Bill has been producing some of his own fine coverage of Lotusphere 2012 and IBM Connect here in Orlando, and I wanted to share the link below to his post on some of IBM’s own social business endeavors.